The Honour Rolls – The 60th Battalion C.E.F. 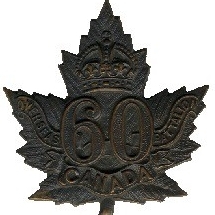 "Victoria Rifles of Canada"
Honour Roll of men who attested to other units, served with the 60th Battalion but died serving with other units. “They shall grow not old, as we that are left grow old.